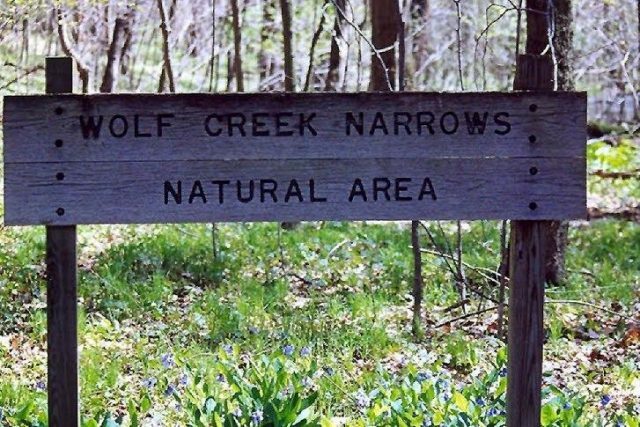 Wolf Creek Narrows Natural Area is particularly known for its spectacular display of spring wildflowers. An active floodplain, mature northern hardwood forest, and scenic cliffs make this property one of WPC’s most popular. It is believed that the steep, narrow gorge of Wolf Creek Narrows originally formed when the ceiling of an ice-age cave eroded and collapsed due to runoff from the melting glacier. The site now consists of a high-quality stream meandering through towering 50-foot cliffs. These natural processes, including annual flooding and ice scouring, as well as limited human activities, have resulted in diverse natural communities. Hiking the trail requires negotiating steps, a narrow plank crossing and steep slopes. Wear sturdy boots or shoes, and bring water. Be prepared for your visit with the following resources. We recommend downloading these files to your device prior to visiting: brochure and maps. The parking area is located on the Miller Woods tract, owned and managed by Slippery Rock University. The southern parcel of the Natural Area is accessible only from the creek. Mature forest, Wolf Creek floodplain and streambank, spring wildflowers, vernal pools, old fields. From the Slippery Rock exit off I-79, go east on Rt. 108 to Slippery Rock. At the light in town, turn left on Rt. 258. Go one block, turn left on W. Water St., and follow it for approx. 2 miles (W. Water St. becomes Miller Rd.) until it crosses a bridge over Wolf Creek. Cross the bridge and turn left into a small parking area at the head of a dirt lane. Walk back across the bridge, and the trailhead is on the left. Please use caution and watch for traffic along the road. From the trailhead and kiosk, a 1.5-mile loop footpath begins by leading upstream over level terrain to the point where the creek is pinched between rocky bluffs. The trail then climbs steeply along the sloping shoulder of the gorge’s eastern flank, meanders through an upland deciduous forest, and then descends back to Wolf Creek just upstream from the starting point. The trail is moderately-difficult, but suitable for families with children. The mixture of riparian and upland communities provides habitat for a variety of wildlife. Birds include belted kingfisher, Louisiana waterthrush, wood thrush, and the occasional osprey or bald eagle. Small, isolated pools of water provide breeding habitat for amphibians. Abundant logs on the forest floor offer cover for salamanders and snakes. review the Guidelines for Public Use of WPC Preserves document prior to your visit.